Vor 8 Minuten kam eine helle Feuerkugel in gelblich rötlicher Farbe mit langen Schweif über Helgoland rein. Sie kam in einem 6o Grad Winkel von Zenit und flog Richtung Westen über Nordsee. 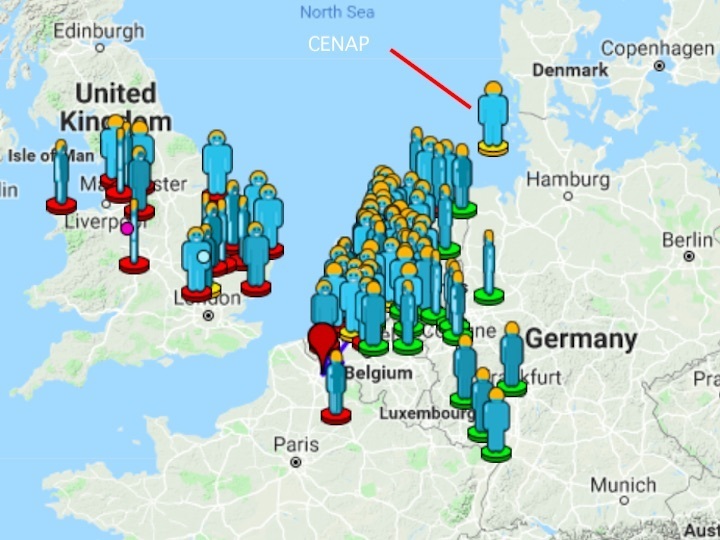 On Wednesday evening around 21:15 UT there was a bright fireball observed from Belgium, Germany, the Netherlands, England, France, Switzerland, and as far as Wales! 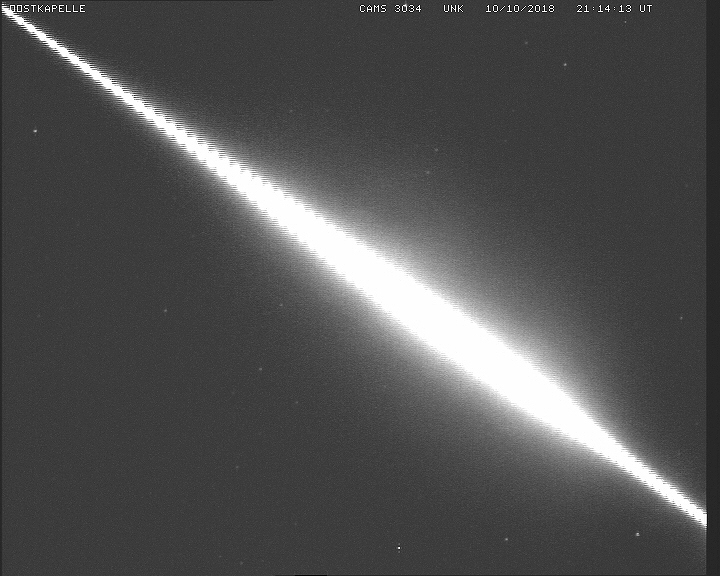 The IMO has already already received more than 80 reports and this very bright fireball was caught with different cameras. 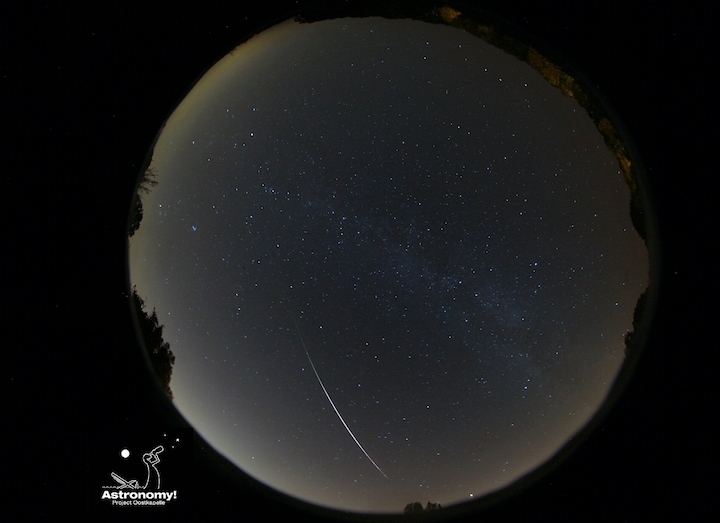 The French meteor network FRIPON caught the fireball with several cameras located in France, the Netherlands, Belgium, Switzerland, and Germany. So far, there are more than 80 reports of the fireball which allowed the computation of a trajectory. It stretches from the Dutch border to the French border crossing all the way over Belgium. 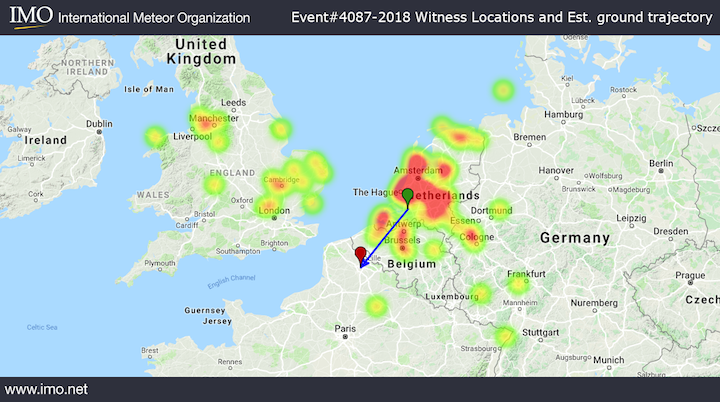 We received 93 reports about a fireball seen over Brussels Hoofdstedelijk Gewest, England, Flevoland, Friesland, Gelderland, Grand Est, Groningen, Hauts-de-France, Hessen, Limburg, Noord-Brabant, Noord-Holland, Noordrijn-Westfalen, Nordrhein-Westfalen, Overijssel, Rheinland-Pfalz, Schleswig-Holstein, Utrecht, Vlaanderen and W on Wednesday, October 10th 2018 around 21:15 UT. The CAMS network caught the fireball on four cameras. Using the data from the three cameras located in Oostkapelle, Graphfontaine, and Gronau, the radiant position could be computed from Carl Johannink to be at the border between the constellations Lynx and Gemini. 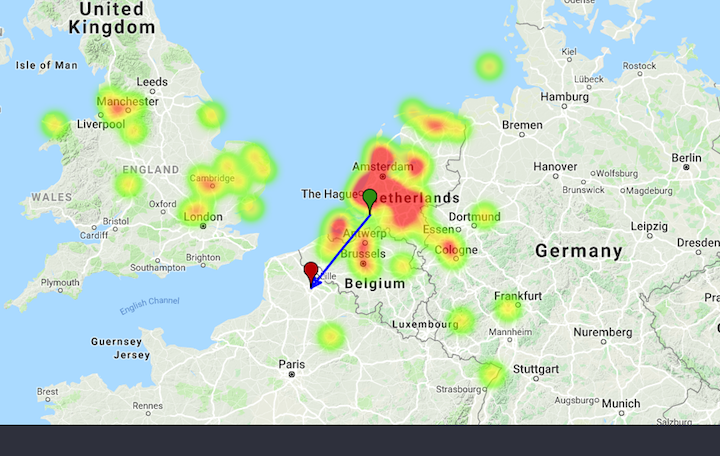 Furthermore, he could derive that the fireball started somewhat southwest of Utrecht, The Netherlands, at ~138 km height, ended in northern France, ~80 km southeast of Lille (~87 km height), and has a high geocentric velocity of a bit more than 65 km/s. 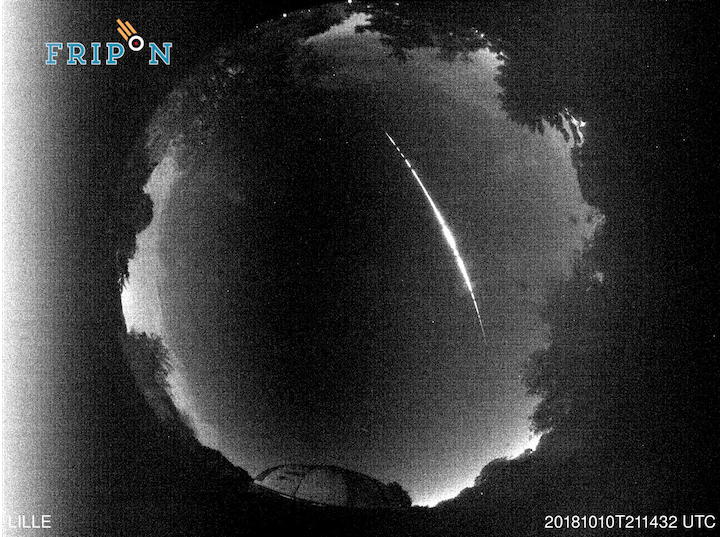 Klaas Jobse caught the fireball on an all-sky camera at Oostkapelle, The Netherlands, the persistent train could be followed for 30 minutes on the all-sky camera. Weitere Meldungen zur Feuerkugel bekamen wir aus Nettetal, Wiesbaden-Schierstein, Neuss, Trier und Hanau.